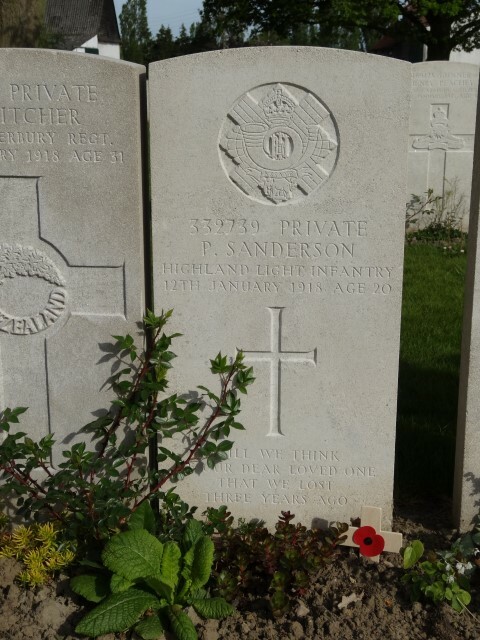 332739 Private Percy Sanderson, 9th Battalion, the Highland Light Infantry died of wounds 12 January 1918 and is buried at Lijssenthoek Military Cemetery, Belgium. He was 20 years old and is commemorated on the West Auckland War Memorial and the Roll of Honour, West Auckland Memorial Hall. Percy Sanderson enlisted at Bishop Auckland joining the Highland Light Infantry being given the regimental number 332739. His service details have not been researched. The dates when Private P. Sanderson enlisted and went to France are unknown due to lack of research. Perhaps he joined up when he reached the age of 18, say during 1915 and after a period of training went to France during 1916. Battalion left ERIE CAMP at 8.20 am and proceeded by bus to WHITBY CAMP arriving about 10.30am: platoon marched from YPRES square: the men are accommodated in tents and huts: a good camp. Raining driving the afternoon and evening. A small shell landed in the camp during the morning but no damage was done. All officers who were not in the line during the last tour leave camp at 6am to reconnoitre the trenches [tracks?] etc. leading up to the line. One officer and 50 other ranks of the battalion are employed on carrying work in support area near KANSAS CROSS: thawing rapidly. The enemy carried out an area shoot on the forward slope and top of PASSCHENDAELE ridge about 10am and continued till about 12 noon: we had 2 men killed 7 wounded and 2 are missing. There was a good deal of movement in the area with working parties from the rear: hostile aircraft flew over our lines and noticed this work going on. Things quietened down about noon. The battalion has relieved the 2nd Bn the Royal Welch Fusiliers in the left front subsector: we ————- 5 casualties during the relief one of which was killed. The relief was not a good one owing to a number of ———-some guides losing direction and being wounded. Relief commenced at 5pm and was not complete until 2.30am. The 10th has been a quiet day on the whole. There has been a good deal of shelling round HAMBURG and HILLSIDE and ration parties have been harassed. One guide was killed. It was very quiet at midnight. An intercepted wireless message says that the enemy is carrying out a hostile shoot on our front between 10pm and 2am All due precautions have been taken and everything is ready. It has been thawing all day and the ground is very soft. D Coy in Reserve in HAALEN SWITCH close to HILLSIDE with 5 posts. Coy HQs in a PILLBOX, we had 2 men killed and 7 wounded during the day and night. 11th INDIGO 5pm Captain Forbes Royal Navy arrived at Bn HQs on an experimental tour for one day: he has been sent to CREST FARM to gain experience there. The thaw continues and the ground is very soft: a quiet night – very dark. We had 2 men wounded during the day. Private P. Sanderson died of wounds. He could have been wounded on any of the 3 days preceding as a result of enemy shelling. Between 9 and 12 January 1918, 1/9th Bn., Highland Light Infantry lost 7 Other Ranks killed in action or died of wounds, 2 ORs including Private P. Sanderson died of wounds 12 January 1918. He was treated in No. 10 Casualty Clearing Station. Private P. Sanderson was awarded the British War and Victory medals. During WW1 the village of Lijssenthoek was situated on the main communication line between the Allied military bases in the rear and the Ypres battlefields. Close to the front but out of the extreme range of most German field artillery, it became a natural place to establish casualty clearing stations. The cemetery was first used by the French 15th Hospital D’Evacuation and in June 1915, it began to be used by CCS of the Commonwealth forces. From April to August 1918, the CCS fell back before the German advance and field ambulances took their places. 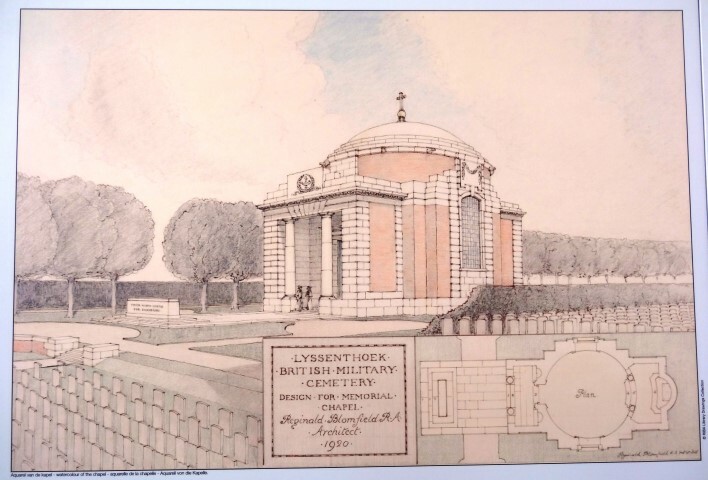 The cemetery contains 9,901 Commonwealth burials of the First World War. Private Percy Sanderson is commemorated on the West Auckland War Memorial and the Roll of Honour, West Auckland Memorial Hall.